Rev. Ratliff and Minister Karen Jacobs from Brentwood Baptist Church awarded a cheque to Santa Maria in September 2018. The children from St. Stephens Church held a White Elephant gift swap and personally delivered the toys for the children at Bonita House in December of 2017. Lucy's Boutique and Gifts delivered a large donation of brand new clothing and racks to help display the items so that our clients were able to pick and choose what they liked and needed. Because of you Santa Maria helped 3,300 women and children last year alone. You can support our mission in different ways. GATHER YOUR FRIENDS, FAMILY AND/OR CO-WORKERS FOR A DRIVE TO BENEFIT THE WOMEN AND CHILDREN OF SANTA MARIA. Back to School Drive—Many of our clients cannot provide the necessary items for their children to take to school. Items needed: school uniforms, backpacks, pencils, erasers, colored markers, pens, rulers, scissors, notebooks, ruled paper, binders, scotch tape, and construction paper. Christmas Drive for Moms and their children—Christmas is a special time for our moms and children. We are looking for items for about 80 children ranging in ages from newborns to 16 year olds and about 140 mothers. Items needed are: toys (all ages), gift cards, toiletries, soap, body lotion, hair care items, make-up sets (no aerosols and no products containing alcohol), shawls, hats, picture frames (no glass), notebooks, jewelry items (no pins), colored markers, glitter glue, card stock materials, construction paper. Clothing Drive — New and gently used clothing are needed in all sizes. 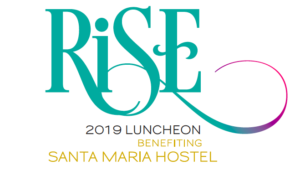 Please call or email Cynthia Turner at (713) 205-6886 cturner@santamariahostel.org to coordinate this events. Care Package / Toiletries Drive — Our client need the same toiletries and hygiene products that we ourselves use when getting ready each day. A list of daily needs are: shampoo, conditioner, deodorant, body lotion, bar soap, bath gels, toothpaste, towels, umbrellas. At your convenience you can make monetary donations to Santa Maria Hostel via mail Attn: Cynthia Turner (2605 Parker Rd. Houston, TX 77093), online, in person and over the phone. We also have secured PayPal giving, credit card, and electronic check. You can give a gift to Santa Maria Hostel in memory of someone special or to honor a loved one. This can be made online through our webpage or by mailing in your donation. Please check with your employer to determine the policy for matching gifts. You could double your gift when you make your next gift to Santa Maria Hostel. New and gently used clothing are needed in all sizes. Please call Cynthia Turner at (713) 205-6886 to coordinate donations. Please note that only new car seats are accepted due to safety concerns. This type of project can be for both children and/or adults. Our clients need toiletries and hygiene products every day when getting ready to start their day. Donations of products like shampoo, conditioner, deodorant, body lotion, bath gels, soap, tooth paste, tooth brushes, towels are always welcome. Donations of tickets to local events, attractions, sports events and other entertainment are welcome. This can give our clients the opportunity to experience off-site events, feel special and appreciated.